Gorman Houston, a former chief justice of the Alabama Supreme Court, focuses on mediation and arbitration. Prior to joining Lightfoot in 2005, Justice Houston spent 20 years serving as a justice on the Alabama Supreme Court, including 10 months as its chief justice. 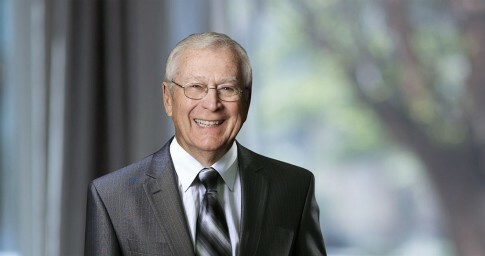 His long service on the bench makes Justice Houston uniquely qualified to serve as a mediation or arbitration neutral in a variety of cases. He has a particular focus on arbitrating and mediating cases that are on appeal. A former Air Force JAG officer, Justice Houston has previously served as a Bar commissioner and a member of the State Bar Disciplinary Commission. He also clerked for Alabama Supreme Court Chief Justice J. Ed Livingston after finishing law school. Justice Houston's own time on the bench has been recognized by several legal groups. The Alabama Trial Judges, for example, presented him with a gold watch for “Exemplary Service as Acting Chief Justice,” and he also received a certificate of Recognition for Meritorious Service from the Alabama Association of Circuit Clerks. In 2005, Justice Houston received the Alabama State Bar Commissioner’s Award for contributions to the administration of justice and legal profession, and was awarded the Mobile/Baldwin County Bar Association’s Howell T. Heflin Award for bringing honor and integrity to the profession. In 2009, he received the Chief Justice Professionalism Award. Justice Houston is also a Fellow of both the Alabama Bar Foundation and the American Bar Foundation. He served as an Alabama Commissioner on the Uniform State Law Commission. Justice Houston has not limited his service to just the bench — he has spent a lifetime giving back to the communities in which he lives. He was mayor pro tem of Eufaula, Alabama, and has also served as president of the Eufaula Chamber of Commerce, Barbour County Hospital Association, Water Works and Sewer Board, Heritage Association, Kiwanis Club, Rotary Club, Country Club, Quarterback Club and the Eufaula Bar Association. He received the 2008 Alabama Appleseed Albert Brewer/Bo Torbert Public Service Award. Justice Houston is a member of First United Methodist Church of Montgomery and has served as a trustee of the church property. He has been married to Martha Martin Houston for more than 60 years, and they have two children, Mildred Vance Houston, J.D. and Dr. J. Gorman Houston III, along with three grandchildren: Katherine (Katie) A. Sasser, Martha H. Sasser and J. Gorman Houston IV.